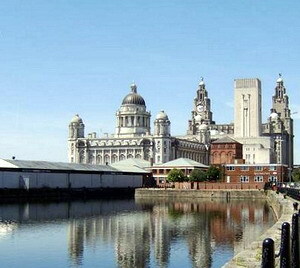 On the west coast of England, Liverpool is famed worldwide for two major exports, music and Football. Hailing from Liverpool the Beatles were arguably the greatest band the world has ever known with a string of number 1's on both sides of the Atlantic, the Beatlemania of the 1960's had not been seen before and not been repeated since. Liverpool has 3 football teams but to dismay of Tranmere and Everton it is Liverpool Football Club that is best known in the world as a result of its all conquering team of the 1970's and 1980's which swept all before it domestic and European competition. Liverpool grew into a city in the 19th & 20th century where its growth was fuelled by its port which brought in the raw materials from across the empire which fuelled the textile industries of Lancashire and Manchester and then exported the finished products across the World. Like many of England's industrial cities Liverpool suffered real decline in the 1970's and 1980's with its once busy docks falling into virtually disuse. However in recent decades the city decline has been reversed and the city centre revitalised. The derelict docks have now become some of the most sought after accommodation in the city. Liverpool John Lennon Airport is situated just 7 miles to the south east of the city centre. One of the oldest airports in the England it is only in recent years that it has grown into a significant international airport. The explosive growth of the low cost carriers in the UK market and the decision of a number of the major charter airline to base aircraft at Liverpool has benefited the airport enormously. It now services 10 airlines flying to over 20 destinations across Europe. If you are looking for Car Hire, the Car Hire 3000 offer car hire in Liverpool and throughout the world at fantastic prices.